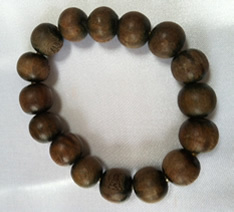 When I completed my 500 hour yoga teacher training, I, along with five others, received a wooden mala bracelet from our teacher. For me, this bracelet was a symbol of two years of work and dedication and the acknowledgement by my teacher of this accomplishment. I wanted to wear this bracelet when I taught as a reminder of what stood behind me as I worked with students. The bracelet, however, was too big for my wrist and would drop off if I wasn’t careful. I was fearful of losing it. I took it to a jewelry store and asked if they could make the bracelet small enough to stay put on my wrist. When I returned a week later, I was dismayed to find the mala knot and bead in a little plastic bag and the beads restrung on a piece of clear stretchy plastic. The woman who had restrung the beads explained there had been no way to shorten the bracelet and still preserve the head bead and knot. While I could now wear the bracelet, I was unhappy with the reconfiguration, feeling that it had now been cheapened. I left the store without paying. In spite of my initial reactions, I found myself starting to wear the bracelet. In fact, I wore it everyday I taught. And I wore it when I went away to study yoga. And, I found when I wore it I still felt its reassurance, its reminder of everything and everyone at my back as I took up new yoga-related endeavors. While it might appear a happy ending, in the back of my mind I was remembering I had not paid for the work allowing me to have this connection. “I have to pay for it,” I thought. But I felt embarrassed to go to the store and tell them what had happened. The memory continued to nag at me. “Asteya” is the third ethical principle or “yama” in the Yoga Sutra. It directs us to avoid taking or receiving something without agreement or compensation. It prohibits stealing. While most of us do not think of ourselves as thieves, practicing this principle requires greater awareness and subtlety than appears at first. While I didn’t leave having compensated the store for my old outstanding debt, I had tried to make things right. That is what the practice of “asteya,” and the other yamas or ethical principles help us to do. They help us to keep things “right.” When we slack on how we live, our hearts and minds cannot be a peace, nor can those of others we might fail to treat ethically. When we practice living with compassion for other beings, being truthful and honest in our thoughts, our words, and actions, we keep things right. With things right, we can live with settled, content hearts and minds. Living the yamas is a path to happiness.